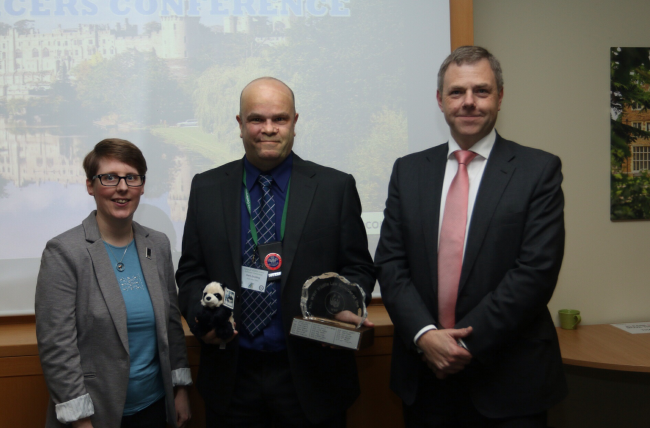 On Saturday [28 November], two Welsh police officers were recognised for their work fighting wildlife crime at the National Wildlife Crime Enforcers Conference. Sergeant Rob Taylor of the North Wales Police Rural Crime Team won the WWF-sponsored Lifetime Achievement Award for 30 years of police service. For the past eight years he has been the lead wildlife investigator, and for the past two years he has also been manager of the rural crime team. 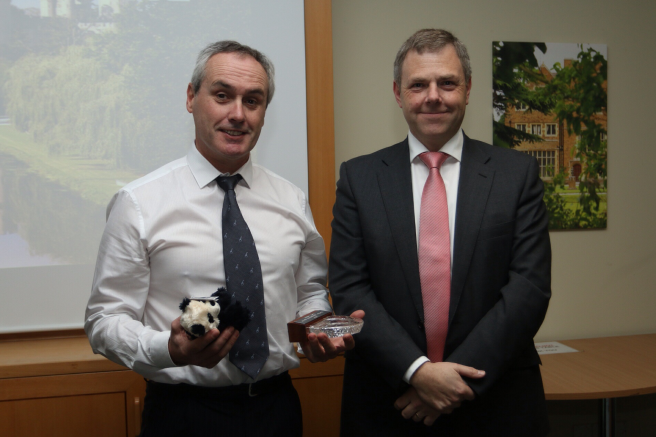 PC Mark Goulding of South Wales Police, currently on secondment to Natural Resources Wales, won the WWF-Sponsored Wildlife Law Enforcer of the Year Award 2015 for his wide range of work from tackling fishing poaching to raising awareness amongst partner agencies. The officers were presented with their awards by Sarah Goddard, Species Policy Officer at WWF-UK, and Chief Constable Simon Prince of Dyfed-Powys Police at the National Wildlife Crime Enforcers Conference at Leamington Spa, where law enforcers, statutory agencies and NGOs gathered to hear the latest views, approaches, successes and challenges of combating wildlife crime in the UK. Throughout his time as wildlife sergeant, Sgt Rob Taylor has undertaken a vast and varied amount of work to protect the environment. On his appointment as lead wildlife investigator, Sgt Taylor secured a prosecution in the case of a large-scale bat roost destruction and was the first officer in the UK to use impact statements to assist the court with understanding the detrimental effect of the crime on that particular species. This format has been adopted by other police forces and has seen a large rise in fines. Sgt Taylor, who is due to retire in 2016, is keen on promoting the work being undertaken by wildlife law enforcers across the UK through a number of working groups of which he is a member, speaking at a number of conferences and events, and his use of Twitter. His is the eighth most-followed account of all UK police officers (@NWPRuralCrime). PC Mark Goulding, who developed the River Taff Project with colleagues from Natural Resources Wales, has helped reduce poaching on the river between Cardiff and Merthyr Tydfil, and a number of prosecutions are currently ongoing thanks to his work. Also thanks to the work of PC Goulding, three men were prosecuted for releasing into the wild a viable breeding population of wild boar following a commercial burglary. PC Goulding has recently taken on the responsibility of being the Historic and Ancient Monument Crime Single Point of Contact for South Wales Police and reports to the force’s Assistant Chief Constable. He has recovered a fossil from a historical theft on a site of special scientific interest in Mid Wales and is currently working on a case of damage in the Gower.